How to Make A Wine SuperStar? 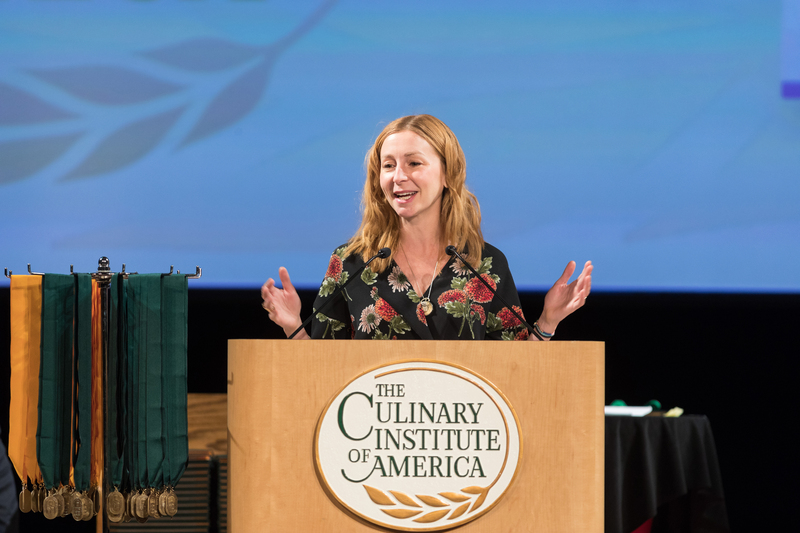 Introducing Tims Rewards by Tim Hortons® in the U.S.
Hyde Park, NY – Television personality and founder/owner of Milk Bar, Christina Tosi, delivered the commencement address during associate degree graduation ceremonies at the New York campus of The Culinary Institute of America on December 19. In the decade since she opened the first Milk Bar in New York City, the company has expanded to Toronto, Ontario; Las Vegas, NV; and Washington, DC; with a Los Angeles location on the way. She has earned two James Beard Foundation Awards: Rising Star Chef of the Year in 2012 and Outstanding Pastry Chef in 2015. While running the dessert program at Momofuku, Chef Tosi developed innovative ideas to turn dessert on its head—like creating cereal milk. The first Milk Bar opened in 2008 as the dessert and bakery spin-off of David Chang’s renowned restaurant. Christina Tosi is the author of Momofuku Milk Bar, Milk Bar Life, and All About Cake. She has been featured on television programs from Late Night with Jimmy Fallon to Chef’s Table and has been a judge on Masterchef, Masterchef Junior, and Chopped. Chef Tosi was a member of Fortune magazine’s “40 Under 40” for 2018, and has graced the covers of Adweek and Cherry Bombe. In a separate ceremony the previous day, the CIA bestowed diplomas upon recipients of bachelor’s degrees in Food Business Management, Culinary Science, and Applied Food Studies. The entire CIA commencement ceremony, including Chef Tosi’s address, can be seen online. Founded in 1946, The Culinary Institute of America is the world’s premier culinary college. Dedicated to developing leaders in foodservice and hospitality, the independent, not-for-profit CIA offers master’s, bachelor’s, and associate degrees with majors in culinary arts, baking & pastry arts, food business management, hospitality management, culinary science, and applied food studies. The college also offers executive education, certificate programs, and courses for professionals and enthusiasts. Its conferences, leadership initiatives, and consulting services have made the CIA the think tank of the food industry and its worldwide network of more than 50,000 alumni includes innovators in every area of the food world. The CIA has locations in New York, California, Texas, and Singapore. We are always looking for things we think our readers will value. If we make an affiliate partnership like the one featured in this article, then we may see a share of revenue. Eat Drink News is your Eat&Drink news website. We provide you with the latest news and videos straight from the eat&drink industry.